Aside from having some of the best gameplay that we’d experienced at the time, NBA Live 2000 is considered a classic because it introduced several new features. As well as the aforementioned Legends – which were definitely a big deal – the game also saw the debut of Franchise mode. 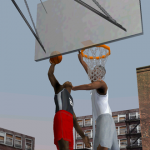 The Practice mode that had been introduced in NBA Live 99 also returned, but in addition to a solo shootaround, the concept had now been expanded to include a 1-on-1 mode. Cover player Tim Duncan was selected as the away player by default, but it was Michael Jordan who gave the mode its branding, while also being the default home player. 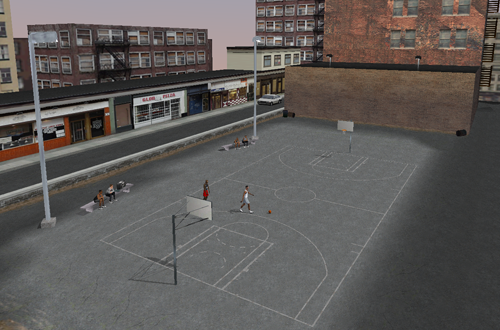 Games took place on the same street court featured in NBA Live 99’s Practice mode. Michael Jordan had his own custom gear – a black number twenty three singlet and red shorts – while all other players wore randomly selected generic uniforms. The game’s soundtrack was part of the ambient noise, as if it were coming from the boom box on the sidelines. Rahzel provides some DJ banter in between tracks, a feature that was exclusive to gameplay set on the street court. There was also the sound of traffic going by, and you can hear the players talking trash to each other upon making a shot, grabbing a rebound, being fouled, and blocking their opponent’s attempts. The gameplay mechanics are identical to the regular five-on-five game, only there obviously aren’t any teammates to pass to. After shooting to see who gets the first possession, standard one-on-one rules apply. You aren’t allowed to double dribble, fouls result in possession from the top of the key unless a basket is made, and there aren’t any free throws. The ball must be checked behind the three-point line on a change of possession, otherwise any basket you make won’t count. The ball is also checked after each basket, and by holding down the shoulder buttons, you can check it between your legs, roll it to them along the ground, or throw an aggressive chest pass. In addition to choosing whether you wanted to play during the day or night, you could set the winning condition to first to 11, 15, or 21, as well as change the difficulty and whether you wanted to play with the Simulation or Arcade settings. On Simulation, fouls were called and gameplay was realistic. When the Arcade setting was enabled, players jumped a lot higher on certain dunks – almost NBA Jam-style – and you could steal the ball by knocking down your opponent with the hand check button. I can attest to Superstar difficulty being virtually impossible, due to the way that the CPU is able to always stay in front of you, and very rarely falls for your moves and fakes. Although there wasn’t much more depth to 1-on-1 mode than that, it was a worthwhile addition to the game. It’s something that we had wanted to see, and I’d say that most of us enjoyed firing it up every once in a while as a change of pace. It had value as a means of practising with an opponent, mastering the basics of man-to-man defense and breaking down defenders alike. I’m sure that a lot of gamers used it as a means of playing out some “Who is better?” scenarios, and there was obviously replay value as a multiplayer mode. 1-on-1 became a staple of NBA Live’s selection of modes, with the current cover player always being one of the default selections. Michael Jordan in 1-on-1 had an additional function in the Nintendo 64 version of NBA Live 2000. As His Airness was the only Legend in the N64 version, EA added some platform-exclusive content by giving the mode a challenge. If you defeated MJ, he would be unlocked and appear in the Free Agent Pool, where he could then be signed to any team in the league. Of course, there were no additional conditions to the challenge, meaning that you could select Arcade mode and Rookie difficulty if you wanted an easy way to win. It defeated the purpose, but if you wanted to unlock MJ quickly and start using him in other modes a lot sooner, it was the easiest method. Bringing it all back to Tim Duncan, you may have noticed that I’ve barely mentioned him through this article, except to note that he was the default away player in Michael Jordan in 1-on-1 mode. That was intentional, as it underscores how Duncan was kind of an afterthought in the very game that featured him on the cover. Not only was MJ the player used to promote the new 1-on-1 mode, but the intro video for NBA Live 2000 prominently features Kevin Garnett, who would go on to grace the cover of NBA Live 2001. Perhaps it stands a metaphor for the selfless way that Tim Duncan played basketball; even in “his” video game, the spotlight is on other players. MJ’s name would be dropped from 1-on-1 mode in subsequent games, but the mode itself remained in NBA Live through the PlayStation 2 version of NBA Live 09. It’s since made a comeback as a scrimmage option in the practice modes of recent NBA Live games, but it all started with Michael Jordan in 1-on-1 in NBA Live 2000. It not only represents the innovative nature of NBA Live back in the late 90s and early 2000s, but also the strength of the brand at the time. Just as NBA 2K11 would later demonstrate, Michael Jordan’s presence meant a lot to basketball video games, and made them significant…even when another player was technically the featured star.